Scones & Cream Filled Cakes! 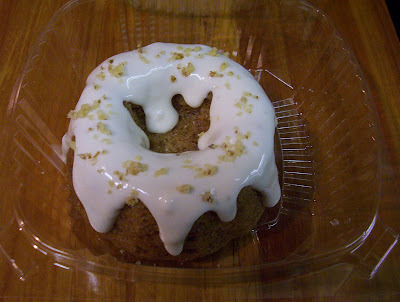 Venerable Bean baked goods are available at Slight Indulgence downtown. They now have Toasted Almond Muffins w/CinnamonΝtmeg, Chocolate Chip Muffins, Peanut Butter Chocolate Chip Cookies and Oatmeal Chocolate Chip Cookies! Chocolate Cakes w/Ganache, muffins, cookies and more are at the co-op. Double Chocolate Brownies(gluten free), Cranberry Ginger Muffins, Lemon Poppy Cookies, Oatmeal Raisin Cookies, Chocolate Cake w/Ganache and Buttercream and Granola Bars are at the co-op! Cream Filled Vanilla Cakes, Oatmeal Raisin Cookies, Chocolate Chip Muffins and more are at the co-op. I took my first trip to Lewisburg, WV this weekend to meet up with a few friends. I hit up the Lewisburg farmers market early in the morning. It was already busy and I picked up a hearty loaf of whole wheat raisin peacan bread from Jeff's Bread. Next stop was The Wild Bean. It's a great coffee spot with an all vegetarian cafe menu. It was nice to see vegan burrito listed on the chalk board as I walked in the door. Potatoes, avocado, spinach, fakin bakin and fresh salsa. Tasty! If you are in Lewisburg check them out. Peanut Butter Cookies, Chocolate Cherry Chunk Cookies, Orange Spice Currant Muffins, Chocolate Cake with Ganache and Raspberry Filling are at the co-op. I made this cake as a special order. It is moist, rich, delicious and gluten free. Double Chocolate Brownie covered with Vanilla Buttercream! Blueberry Scones are not pictured but are at the co-op. They are really good! You can also get a Peanut Chocolate Chip Granola Bar or a Carrot Cake with Orange Butter cream. Lemon Cake with Lemon Custard and Vanilla Buttercream. So Good! They are at Slight Indulgence if you would like to eat one. Chocolate Peanut Cookies, Ginger Peach Muffins, Double Chocolate Brownies and Lemon Cadet Cakes are at the co-op. Apricot Almond Scones, Chocolate Chip Cookies, Granola Bars, Maple Walnut Cookies and Vanilla Cakes with Chocolate Cream Filling are at the co-op. Slight Indulgence have Carrot Cakes with Cream Cheese icing. Stop in to pick one up. Carrot Cake with Cream Cheese Icing, Orange Chocolate Chip Scones, Macadamia Chocolate Chip Cookies and Apple Pecan Granola Bars are at the co-op.